A series of tragic accidents involving young drivers on Scotland's roads in recent weeks has shown that more still needs to be done to improve road safety across the country, Transport Minister Stewart Stevenson said today. Mr Stevenson was speaking as he named members of an expert group set up to help advise on what more can be done to combat the problem. The aim is to inform a new 10 year strategy on road safety for Scotland. Bob McLellan, civil engineer with a doctorate in project/construction management. Head of transportation services at Fife Council and past Chair of the Society for Chief Officers of Transportation in Scotland (SCOTS) Engineering Committee. "Too many lives are being lost needlessly on Scotland's roads. We have all seen the devastating consequences of road accidents, and sadly, this has been all too evident in recent weeks. "It appears that drivers, particularly those under the age of 25, are still taking unnecessary risks and putting lives in danger. "We need to think carefully about what more we can all do to stop the tragedies we are seeing week in, week out. "The expert group I have announced today are some of the leading thinkers on road safety in this country. They are from a range of different backgrounds, and they will help us explore the options available to us all to try and halt the death toll on Scotland's roads. "Each fatality is one too many, and from a government perspective, we want to produce a new 10 year strategy on road safety for Scotland. The expert panel will help inform that new strategy. "We are absolutely committed to doing all we can to improve road safety across Scotland." The Minister announced on June 12 that he would be bringing together experts from across Scotland and beyond - the police, advanced driving experts, road safety organisations, the Children's Commissioner, youth groups and others - to advise on what more could be done and identify options to provide greater protection for drivers. This will help to inform a new 10 year strategy for road safety in Scotland. Recent statistics showed a 10 per cent increase in road fatalities on Scotland's roads. Next week, ACPOS will be holding a young driver summit. Members of the expert panel and the Transport Minister will be attending this important police summit to hear views on what can be done on young drivers. The Scottish Government recently funded a six month pilot scheme in the Grampian Police area, aimed at increasing take up of the Pass Plus post test driver training scheme. Pass Plus provides training on elements of driving not covered in the driving test, including driving in town, on rural roads, at night, in all weathers, an dual carriageways and on motorways. The Government paid £75 towards the cost of the training in Aberdeen, Aberdeenshire and Moray Council areas. When added to existing discount from councils, this gave young people 90 per cent off the cost of the pass plus course. The pilot has recently come to an end and the Government will be analysing the results. Mr Vine was Assistant Chief Constable in Lancashire Police and was appointed Chief Constable for Tayside Police in November 2000. He is a past President of the Association of Chief Police Officers Scotland (ACPOS) and currently Chairs the ACPOS Road Policing and Operational Policing Business Areas. Mr Vine is also Vice Chair on the board of the Scottish Police Services Authority. Neil was Head of Policy with the AA Motoring Trust having worked in a similar role with the AA since 1992. He was National Programmes Director for EuroRAP (European Roads Assessment Programme) coordinating accident risk analysis work in several European countries. He has recently been appointed Director of the IAM Motoring Trust. Neil is an advisor to the CBI Scotland Transport Committee and is actively involved with many of the new Regional Transport Partnerships in Scotland. He is a member of the Scottish Safety Camera Programme Advisory Board and is Chair of the Publicity Committee of Road Safety Scotland and a member of the Scottish Accident Prevention Council. Michael McDonnell is the Director of Road Safety Scotland. He has a Diploma in Theology and a Degree in Divinity, and was a primary school teacher before embarking on a career as a local authority road safety training officer. In 1990, he was appointed Road Safety Manager (Scotland) with the Royal Society for the Prevention of Accidents (RoSPA), and Secretary of the Scottish Accident Prevention Council (SAPC), before taking up his current post in September 2004. Michael is responsible for overseeing the day-to-day running of Road Safety Scotland, and has particular responsibility for its publicity and advertising activities. Michael was awarded Fellowship of the Institute of Road Safety Officers in 1997. Stephen Stradling BA (Hons), PhD is Professor of Transport Psychology at Napier University's Transport Research Institute where he has been for 9 years. Previously he worked in the Driver Behaviour Group at Manchester University. Jane was a serving Police Officer with Fife Constabulary. She was the first Policewoman in Fife to achieve Class 1 Advanced Driving Certificate. She became Road Safety Organiser in Fife in 1990 and was appointed Fife Road Safety Manager in 1997. Jane is the current Chair of the Institute of Road Safety Officers Scottish Group. Mr McLellan is a civil engineer with a doctorate (PhD) in project/construction management. He was Director of Roads at Angus Council from 1995 to 2001 and was appointed Head of Transportation Services for Fife Council in 2001. Bob is a past Chair of the Association of Municipal Engineers (AME) (Scotland) Branch and past Chair of the Society for Chief Officers of Transportation in Scotland (SCOTS) Engineering Committee. He was also Chair of the South East of Scotland Transport Partnership (SESTRAN) between 2003-2005. He is a Fellow of the Institution of Civil Engineers, a Fellow of the Institute of Highways and Transportation and a Fellow of the Institute of Asphalt Technology. Kathleen Marshall is a qualified solicitor. She was Director of Scottish Child Law Centre from 1989 to 1994 and has worked as a child law consultant. She is Visiting Professor at the Glasgow Centre for the Child & Society at the University of Glasgow. In April 2004, she took up post as Scotland's first Commissioner for Children and Young People, with a remit to promote and safeguard the rights of children and young people in Scotland. Dr Lawson is a chartered transport planner and has a PhD in the statistical modelling of road traffic accidents. He worked on vehicle design and crash protection at Birmingham University and on traffic and accident analysis in West Midland highway authorities. He led the AA Foundation's collaborative programme with Birmingham City Council and Birmingham University on projects including accidents to young pedestrians and traffic cameras. From 1991-2006 Dr Lawson was AA head of policy research. As the Technical Director within the European Road Assessment Programme (EuroRAP) he has been project manager for the programme from its inception in 2000 and expansion to 23 countries. He has also been an external advisor to the European Union Road Federation. Minister for Transport Stewart Stevenson will today mark the start of a £5.45m scheme to improve a vital stretch of trunk road in the north of Scotland. Mr Stevenson will be on-site to break ground on the upgrade to the A9 between Helmsdale and Ord of Caithness - involving the construction of 2.1km of new trunk road to replace the existing section of this road. Transport Scotland appointed the contractor, RJ McLeod last month to construct the new road between East Helmsdale in the south and Allt Briste in the north. The new section of carriageway will provide an improved alignment and a safer overtaking opportunity. "I am delighted to be here in Helmsdale today, to mark the start of another major investment to make this key route in the north of Scotland safer. "Delivery of the scheme will strengthen the economic lifeline for communities in the north of Scotland and the Northern Isles by providing improved connections for locals, businesses and tourists and an important link with the Scrabster ferry terminal. "I want to reiterate that the Government is committed to having a safer and more efficient transport network and the start of work today is another step forward to delivering this for the people of Scotland." At the southern end of the scheme, a new roundabout will be constructed that will allow safe access to properties at Navidale with new junctions to Navidale Cemetery Road and Navidale House Hotel. The climbing lane provided as part of the previously developed Phase 1 Scheme will be extended by a further 280 metres increasing the northbound overtaking opportunity available. Once completed, the old section of the trunk road will be detrunked and will become a footway, cycleway and access track for the local community and visitors to the area to enjoy. Work is expected to take 12 months to complete. For more information see A9 Helmsdale to Ord of Caithness Improvements. Banff and Buchan MSP Stewart Stevenson has today (Friday) commented on the announcement delivered by Cabinet Secretary for Justice Kenny MacAskill that a new prison will be built in Peterhead, ending years of uncertainty surrounding the prison’s future. This news comes after years of campaigning by Mr. Stevenson together with the Peterhead Prison Officers’ Partners Committee and other community groups to secure the future of the prison. “This is fantastic news and represents years of dedicated campaigning by the local community. In particular, it is a triumph for the prison officers and their families who have worked so tirelessly towards securing the future of this first-rate facility. We can now build on that success. “I am extremely pleased that the uncertainty with which the dedicated prison staff have had to live has now ended. Finally the clouds have been lifted and the future for staff, local residents and the Peterhead community is looking secure and positive. “Seven years ago - when the previous government announced plans to close Peterhead prison – I quite clearly stated that the officers and community deserved better. “Today, as we mark the 100th day of the SNP government, I am delighted that we are able to fulfil a key manifesto commitment, and indeed, redeem a key promise to my constituents in Peterhead. “The local community has fought long and hard over many years to secure the future of this world class facility, and we can now end the uncertainty and indecision that has exasperated prison officers and their families, and undermined confidence in the local community for too long. “I am especially pleased that we are able to announce plans for a prison run in the public sector, for the public interest and not for private profit. We have a great foundation at Peterhead, and we can now build on that strength for the good of the whole community, and indeed Scotland. “I would reinforce the point made by Kenny MacAskill, that this investment is not about improving the conditions for prisoners. The investment is not for pool tables or Playstations. This investment is about delivering a prison estate fit for purpose, and most importantly, about making our communities safer. Freight containers travelling between Grangemouth and Aberdeen will continue to go by rail rather than road thanks to a £750,000 grant announced today. As a result of the award to Direct Rail Services (DRS) over 25,000 lorry trips will be avoided over the next three years. The majority of freight will be ASDA traffic transported on behalf of WH Malcolm. "Many of us have been caught up in delays along the A90. We want to reduce congestion across Scotland and minimise the potential impact on the economy. This award to DRS will continue to free up the route to and from the North East while reducing emissions." Under the Scottish Government's Rail Environmental Benefit Procurement Scheme, DRS has been awarded up to £269,500 for the period from April 2007 to March 2008 and up to £475,700 for the period from April 2008 to March 2010, subject to the outcome of the Strategic Spending Review. This rail traffic previously received funding from the Department of Transport under the Company Neutral Revenue Support freight grant scheme, which was replaced by the Rail Environmental Benefit Procurement Scheme (REPS) on April 1, 2007. REPS is operated by the Scottish Government in Scotland and this is its first award. The grant provides operating subsidy to companies who wish to transfer freight from road to trail where the rail option is more costly. Banff & Buchan MSP Stewart Stevenson has welcomed Cabinet Secretary for Health and Wellbeing, Nicola Sturgeon’s launch of a nationwide discussion document to inform the development of the new Government’s Health Improvement Action Plan to be published at the end of the year. This discussion will help inform the action plan which will, amongst other things, tackle health inequalities, develop community services for people with long term conditions, extend entitlement to school meals, increase accountability and introduce new waiting time guarantees. "I am delighted to see that the new SNP Government are stepping up to the challenge of improving health services across Scotland and involving the public in the process. The Government are giving patients and the public the chance to have their say on how the NHS could perform better. "This is good news for the health and wellbeing of people here in Banff & Buchan and across Scotland. The SNP is aware of the challenges Scotland faces in terms of health improvement such as in life-expectancy and long term conditions and is committed to make progress in these areas. "The SNP Government is determined to help the people of Scotland sustain and improve their health by ensuring local, better and faster access to health care for all. This discussion document places people’s expectations at the heart of decision making in the NHS. I hope people will take the opportunity to contribute to the discussion and I have no doubt that the action plan will benefit from their input." Responses are sought by November 12, and responses and views will be considered as part of the development of an Action Plan for Health and Wellbeing, to be published by the end of the year. Banff & Buchan MSP Stewart Stevenson has welcomed the poll in the Daily Mail by Progressive Scottish Opinion which puts the SNP at 48% to 32% for Labour and also shows 40% of the public are satisfied with the new SNP Government with only 12% unfavourable. "These are sensational figures, showing SNP support up 15 points since the election. Clearly there is no 'Brown bounce' to be seen here in Scotland. The poll reflects the success of the SNP government in delivering our programme for the first 100 days at a pace that has left the opposition parties with little to say. In fact this is the highest opinion poll rating we have ever recorded. "The SNP has built credibility and competence in government, and that is reflected in the satisfaction figures running at over three-to-one in favour. No previous Scottish government has built up such a solid platform of support in such a short period of time. "Support for independence depends on how you ask the question - with as many polls in favour as against - and the important thing now is that the SNP will lead a national conversation on Scotland's constitutional future which will allow the people to have their say." If a Holyrood election was held tomorrow, which party would you vote for? How satisfied are you with the SNP's performance to date? Would you approve or disapprove of Scotland becoming independent? Banff & Buchan MSP Stewart Stevenson has welcomed the announcement by the Scottish Government of the membership and terms of reference of the new Scottish Broadcasting Commission, established by First Minister Alex Salmond to conduct an independent investigation into the current state of television production and broadcasting in Scotland and define a strategic way forward for the industry. “I am pleased to see that the Scottish Broadcasting Commission has been established so promptly, within a week of it first being announced, and that it contains a number of talented and experienced individuals who bring a wide range of experience from a variety of backgrounds. “There is no question that the whole picture of Scottish Broadcasting needs to be examined and also needs to take into account the changed political landscape in Scotland following the elections in May. “Not only that, I am sure the country would benefit from a change in focus in Scottish broadcasting, both by encouraging more Scottish programmes but also by attracting more high-profile programmes and series to be made in Scotland, in the same way that BBC Wales has done with “Dr Who” and “Torchwood”, thus generating income for the industry. “Last year, we lost our local broadcasting identity in the North-east when Grampian Television was subsumed into STV but the reality was that less and less local programming for the North-east had been made in Aberdeen since the STV takeover in 1998. Picture: Stewart Stevenson MSP with Rora Hall Committee members Mr & Mrs Jim Shewan and Bob Anderson. 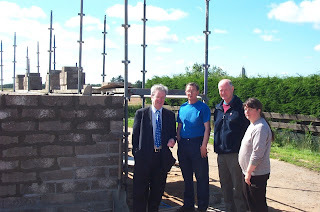 Local MSP Stewart Stevenson took time out of his busy surgery tour of Buchan villages last week to drop in on the improvement works being carried out at Rora Hall. Mr Stevenson met with committee members at the site where he received an update on progress with the hall committee's improvements works which include building of new toilet facilities, meeting room and insulation of the main hall. "Village halls fulfill an extremely useful social function and it is vital that they are well-used and get the support that they deserve from their community. "I am delighted for the committee at Rora that they are making progress with their new facility and I know that the hall is a popular venue for a range of community activities there from dances and car boot sales to bingos. I am sure that the new facilities will be much appreciated by the hall users." Mr Stevenson's surgery tour of Buchan continues tomorrow (Wednesday). See Buchan Observer public notices for full details. Banff & Buchan MSP Stewart Stevenson has called on shoppers to support local business and buy local. Mr Stevenson made the call as he visited local shops as part of during his surgery tour to highlight the quality produce available and the problems being caused by current export restrictions. The Scottish National Party MSP has previously supported campaigns to encourage people to use local produce where possible and support local producers and retailers but the message is all the more important with the current Foot & Mouth outbreak putting severe pressure on the agricultural sector. "In recent weeks the National Farmers Union has been running a 'What's On Your Plate' campaign that has been highlighting the fantastic quality of produce available on our doorstep and the need to reduce the number of miles that food travels to reach the dinner table. "Clearly with the current Foot and Mouth outbreak the message could not be more timely. “The outbreak has resulted in export restrictions which will be in place for some time and this puts tremendous pressure on the agricultural sector and associated businesses. Buying local helps ease some of this pressure and in the longer-term leads to a much more sustainable market. "The agricultural industry is facing a serious threat and needs as much support as people can give them. I urge everyone in Banff & Buchan to help as much as they possibly can by buying local and supporting local business." Banff & Buchan MSP Stewart Stevenson has welcomed the news that Maud Village Trust has been successful in receiving a Big Lottery Fund Investing in Ideas grant. “I was delighted to hear that Maud Village Trust was successful in gaining a £9,600 grant. I am certain that this substantial sum of money will help the Trust greatly. Banff & Buchan MSP Stewart Stevenson has welcomed the precautionary measures put in place in response to the confirmed outbreak of Foot and Mouth disease in Surrey. “The last outbreak of FMD in 2001 was devastating for farmers in the areas affected and had knock-on effects for the whole industry, not to mention the wider economy. “If a lesson was learned from 2001 then it was that reaction to a suspected outbreak has to be much quicker and I am pleased to see that, so far, it appears that that lesson has been learned by DEFRA. "I would like to reassure all livestock keepers that these are precautionary measures. We are in close contact with the UK Government to ensure that Scotland 's interests are being protected. "We are taking all steps to minimise disruption to rural activities but biosecurity is of utmost importance. I appreciate that this will be a blow to those involved in the agricultural shows in many parts of Scotland. I have spoken to the organisers of major shows. "Despite necessary movement restrictions on livestock there are no restrictions on the public and these important events will go ahead." Banff & Buchan MSP Stewart Stevenson has welcomed the announcement that members of the public will be given the opportunity to submit questions to NHS Chairs, Chief Executives and Directors at the annual Government reviews this year. "I strongly welcome the fact that members of the public will be given the opportunity to hold NHS managers to account on the performance of their NHS boards and also that the responses will be a matter of public record. "This process is very different from previous years when members of the public were allowed to attend but not permitted to ask any questions. "There will be a dedicated slot during the meeting where the Minister and the NHS Board members will discuss publicly the questions that have been asked. "The review of Grampian NHS Board will be held in September, and I hope that members of the public in Banff & Buchan will grasp this opportunity to ask questions about issues that are of concern to them about their local NHS board." Exam results are due to be posted throughout Scotland, with Standard and Higher Grade exam results due to arrive on Tuesday 7th August. On that day, Careers Scotland will open the Exam Results Helpline for students who need professional careers advice before they take their next step after leaving school and Banff & Buchan MSP Stewart Stevenson is urging all students not to panic on learning their results and to make use of the service available. “Advisers will be ready to support callers and provide objective careers advice and support, no matter what grades are received. Whether exam results turn out to be better or worse that expected, the freephone number 0808 100 8000 will enable students to talk to advisors who have the most up-to-date information on UCAS course vacancies at colleges and universities across the UK. “Parents and carers should also make use of the helpline, which can reassure them at what can be a worrying time. The important thing for parents and students alike is not to panic should unexpected results arrive. Local MSP Stewart Stevenson has announced details of his seventh annual surgery tour of Banff & Buchan communities. And on Day One of his tour, Mr Stevenson will have clocked-up 450 surgeries since he was elected in 2001. Starting next week, the SNP MSP will be visiting 44 towns and villages in his marathon surgery tour over the next two weeks. Mr Stevenson’s Mobile Office will be criss-cross the constituency, from Inverallochy to Forglen and Sandend to Cruden Bay. “My mobile surgery tour encompasses many small villages and communities and gives me first hand experience of hearing and seeing some of the issues on the ground. “I think it is important for constituents to be able to meet their MSP in their own locality and the summer tour gives me the opportunity to get into some of the smaller communities that I may otherwise not be able to call upon. It is also a very valuable exercise in allowing me to visit rural businesses which I may otherwise not have contact with during the course of the year. The surgery tour kicks-off on Wednesday 8 August in Longside and finishes in Forglen on Thursday 16 August. Note: The surgery tour will take place over 5 days from 8 August to 16 August. Surgeries will be held in the Scottish National Party caravan and no appointment is necessary although constituents are welcome to phone the office in advance to advise their attendance. Details of venues and times are attached and will be advertised in the local press. 12.50pm - 1.05pm, BODDAM, Russell St.
10.30am - 10.45am, GARDENSTOWN, adj. petrol stn. 1.45pm - 1.55pm, NEW LEEDS, Manse St.
Banff & Buchan MSP Stewart Stevenson has welcomed the proposal for “real time closures” of vulnerable fisheries. The idea is being discussed by fishing industry representatives during a series of meetings today in Fraserburgh with Fisheries Secretary Richard Lochhead. Under such a proposal, skippers at sea would themselves sound the alert when they encounter stocks of small cod. Voluntary closure would then apply to protect these stocks which, if caught at present, have to be discarded. “The SNP has said all along that a new approach is needed to the conservation of our vulnerable fish stocks. “It therefore is only common sense that we seek to involve and listen to those who know the sea best and who have most to lose if conservation action is not taken in an appropriate manner – the fishermen themselves. Banff & Buchan MSP Stewart Stevenson has welcomed the announcement by Rural Affairs Secretary Richard Lochhead that the Scottish Government is committing £1million to a major new research programme into animal diseases. “Banff & Buchan is the foremost producer of prime quality livestock in the whole of Scotland and has a reputation second to none. “We were mercifully unaffected by the Foot and Mouth crisis of 2001 but that episode brought home to everyone just how important the security of our food supply is and the continued good health of our livestock. “I am therefore pleased that my colleague Richard Lochhead has recognised this by pledging £1million towards research into reducing the occurrence of a range of diseases and lowering the costs of treating affected animals." "Good animal health is vital to the well being and prosperity of all our rural communities. "I am very pleased that Scotland is playing its part in the wider UK scientific effort to combat animal disease. "Some of these diseases have been identified as priorities for reduction or eradication by the Scottish farming industry. The results will contribute to addressing these diseases and help to promote animal health and welfare. "There is an increasing emphasis in Scotland on collaboration in science and I welcome this opportunity of joint collaborative working both between research bodies and also between UK research funders."